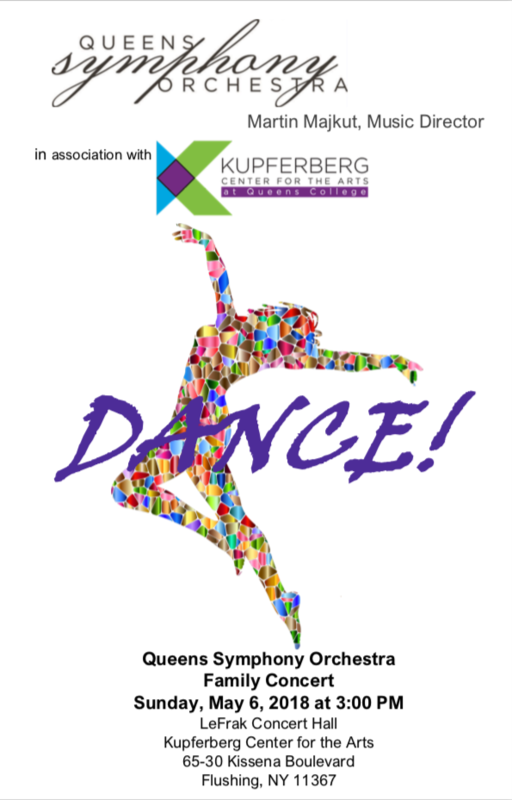 The Queens Symphony Orchestra will present the second in its series of Family Concerts titled “Dance!” conducted by the company’s Music Director Martin Majkut on Sunday afternoon, May 6, 2018 at 3:00 PM in LeFrak Hall at the Kupferberg Center for the Arts at Queens College. Repertoire includes Dances from Three Cornered Hat by deFalla, Valse Triste, by Sibelius and Beethoven’s Symphony No. 7. “Dance and movement are music’s closest cousins” states Martin Majkut, QSO’s Music Director. “On May 6, we offer three different takes on how classical composers used dance as an inspiration for their creations”. “Our excursion starts in Spain with a selection of dances from Falla’s ballet Three Cornered Hat. This music has a strong Andalusian flavor, mixing Spanish and Arabic influences. You will have no trouble spotting several spots where the orchestra sounds like a flamenco guitar”. “A contemplative mood sets in for our second piece. Finish composer Sibelius wrote Valse triste as a brief meditation on the last moments on the Earth. An ailing elderly woman raises from her deathbed and dances with the crowd of invisible guests. Sibelius employs very simple means, intimate orchestral forces and unadorned musical phrasing to create an atmosphere that is retrospective without being sentimental”. “For his Symphony No. 7, German composer Beethoven distilled the elements of dance to their very essence. The entire piece vibrates with sharp rhythmic motives that propel the symphony forward. The first movement starts with a slow introduction but soon the pace picks up and does not let go until the final note. The third movement is breathtakingly quick and, for the most part, very soft, with unexpected accents creating moments of true exhilaration. And the fourth movement is one endless whirlwind! For contrast, the slow second movement proceeds with a measured pace, giving us an ample time to enjoy one of the most beautiful harmonic progressions in all of music”. Tickets are free to the public. Reservations can be made at www.universe.com Seating will be on a first come-first-served basis.